Upon the arrival in Warmia in 1538 of the newly-elected Bishop Johannes Dantiscus (Johann von Hoefen), Nicolaus Copernicus’ life changed for the worse. Accused by the bishop of cohabiting with his housekeeper Anna Schilling the astronomer had no choice but to dismiss her. His sense of isolation grew even stronger after his closest friends Tiedemann Giese and Alexander Sculteti, who both had been encouraging the astronomer to publish his theory of the Earth’s orbit, left Frombork. The former became Bishop of Chełmno (Culm) in 1538 and took up residence in Lubawa (Löbau), whereas Alexander Sculteti, whose intelligence Copernicus valued the most, went to Rome. Sculteti later (in 1540) was proscribed after having been accused of supporting heretical views. Fortunately his solitude was broken in the summer of 1539 when a young mathematician from Wittenberg, Georg Joachim von Lauchen also known as Rheticus (1514-74), visited him in Frombork and persuaded him to publish De revolutionibus. Rheticus helped the astronomer prepare the manuscript for publication but after he had left for Wittenberg in the autumn of 1541, Copernicus was left with only one companion, Georg Donner, a member of the chapter from the spring of 1540. It was he who informed Bishop Giese about the astronomer’s deteriorating health. 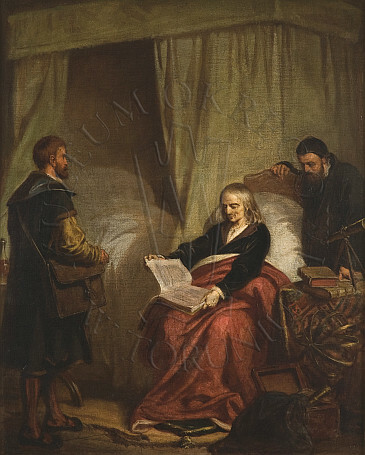 The concerned Bishop of Chełmno (Culm) wrote the following on 8 December 1542: ‘I am deeply worried about the poor health of our venerable old man - Copernicus. Since he very much preferred a solitary life when still in good health, it is quite unlikely there are many good-hearted and faithful people around him who would be willing to share his misery with him now. Still, we should all show our gratitude for his objectivity and mastery in science’. It seems that Copernicus never recovered and that he was not able to read the newly-printed copy of his work. After his death it was his friends and disciples, Tiedemann Giese, Alexander Sculteti and Georg Joachim Rheticus who made every effort to preserve the memory of his name for posterity.